A look at the daily, 240m and 60m charts below from the month end close on Friday show a strong finish to a very strong quarter. 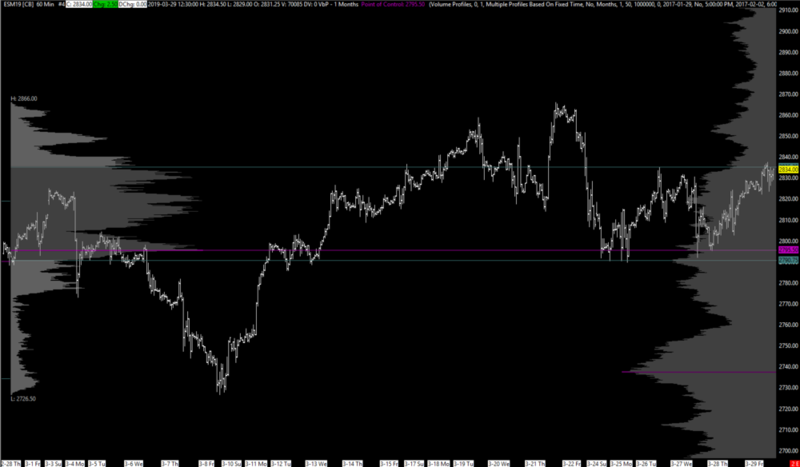 On the daily we can see that it closed above the breakout area formed from the pullback highs in Q4 last year. Value on a monthly basis has moved progressively higher, and the month finished at the value area high for March. This has been helped in part by the big, fast money in CTA Funds - positioning which, according to Nomura estimates, are all 100% long with ratcheting higher sell levels. It’s adjustments to these types of positions that can lead to the fast downside moves seemingly out of nowhere. Couple that with unwinding of short volatility positions and options hedging and you have the tail very much wagging the dog when things go south. However, for now, short and intermediate term bias remains bullish from the price action. Overnight there was news of better than expected PMI number from China (was previously in contraction and now showing expansion again). This helped ES gap higher from the globex open and has so far ranged between 2844.50-2861.25 forming a P shaped profile (often seen with a short squeeze). The high from Friday was 2840.50 and settle was at 2837.75 - ES is currently trading at 2858 so chances of that gap being filled today are low unless news flow changes sentiment. I’d prefer to wait and see how this day trades and how the market behaves towards the gap before trading. Some areas of interest below on the split overnight and RTH profiles.